Machine learning helps us navigate and process large volumes of data. We can ask all sorts of questions about our data, and hope that ML can answer them: what is this data point most similar to? Does the data come in patterns? Can we predict what will happen in the future, given past trends? These questions are applicable to all fields of study. Are you just looking for the code example? Scroll down! Today we're going to figure out how to find clusters of data points. Let's say you work at a medical imaging devices company. Imagine you already have a way to identify malignant cells from an image scan, but it would be great to automatically identify the centers of clusters of cells as well. Then a robot could go in with surgical precision and remove the problem! What we're looking for is a clustering algorithm; today we're going to talk specifically about the k-means algorithm. Clustering algorithms, in general, find groups of similar pieces of data. If you run an online store you might use a clustering algorithm to identify different shopper types. You may find that you have one type of visitor that just window shops through 3-5 pages of products and leaves. Another group might make meticulous purchasing decisions by looking through 15 pages of products and reviews and end up making only one, high-value purchase. And you may also identify the impulse buyer, who makes numerous small purchases without browsing too deeply. Once you've identified your e-shopper demographics, you're better able to optimize your site to increase sales. You can release features that appeal to your impulse buyers, because now you know that you have impulse buyers! And while that's just one practical example of k-means, you'll find this algorithm used in multiple fields. Sometimes it's just image processing in 2 dimensions, other times it's processing huge data across dozens of dimensions and parameters. Like our k-nearest-neighbor algorithm, k-means is versatile, simple to understand and implement, and sneakily powerful. Like k-nearest-neighbor, the "k" in k-means gives away that there's going to be some number that we're going to have to feed to our algorithm. Specifically, "k" is the number of clusters we're going to find in our data. Unfortunately, it's rarely possible to know the number of clusters before you solve the problem, so k-means is usually supplemented by another algorithm that first helps you find the best value of k.
The issue is this: the k-means algorithm will partition your data into "k" distinct clusters, but it does not tell you if that's the correct number of clusters. Your data might naturally have 5 different clusters in it, but if you feed k-means the number 3 you'll get 3 clusters back. Those clusters will be bigger, looser and more awkwardly shaped than if you had told it to find 5 clusters. The long and short of it is this: in order to use k-means you either need to know how many clusters you're looking for at the outset, or you have to use a second algorithm to also guess the number of clusters. K-means just organizes your points into clusters; you need to do something else to figure out the right number of clusters. For today we'll contrive a situation and use three clusters from the outset. Next time (in k-means part 2) we'll look at a technique you can use to automatically guess the value of "k". Most often, these algorithms rely on some kind of error analysis and multiple passes of the k-means algorithm in order to optimize for the solution with the smallest error value. Create "k" additional points, placing them randomly on your graph. These points are the "cluster centroids" -- or the candidates for the centers of your clusters. If any of the centroids moved in the last step, repeat. If nothing moved, exit. It's that simple! As you can see, this is an iterative process. It may take 2 or 3 or dozens of iterations, but eventually your cluster centroids should converge to their solutions and stop moving. You then take the final tally of the assignments and then you have your clusters. This algorithm, like many of the one we'll play with in this series, is susceptible to local optima. If you run the example below a few times you'll see that the clusters can end up in one of a few different configurations. These are various local optima that the solution gets stuck in. Algorithms that start with some sort of random seed state (like GAs or k-means) are particularly susceptible to local optima, because you never really know how the algorithm will start off and which path the solution will end up following. Will this seed state lead to a local or global optima? There's no way of knowing! Like in genetic algorithms, one way to shake out of local optima is to give the solution a little bit of mutation. In our k-means example, we could add a rule that gives a centroid a nudge in a random direction if it doesn't move after an iteration. It might settle back into its last resting place, or it may find a new solution. The nudge shouldn't be big enough that it restarts the solution from the beginning, but just enough to kick a centroid out of a local valley, if it's in one. Another technique we could use is called the "committee of machines", which works well if you're running an algorithm that finishes pretty quickly, or if you have parallel computing capabilities. It's simple: we run the k-means algorithm 3 or 5 or 51 or 10,000 times, and choose the solution that it returned the most often. The term "committee of machines" alludes to the fact that some people choose to actually run parallel algorithms on different pieces of hardware, and a literal committee of machines votes on the solution. Let's dive in. Unlike my other examples thus far, I'm going to forego an object-oriented implementation and just go straight procedural. There are many ways to skin a cat. I love OOP but it's important not to get too comfortable in habits! Additionally, while we're only working with 2 dimensional data in this example, I'd like to write this algorithm out to handle any number of dimensions (except for the canvas drawing functions). Next, we define two functions that are helpful to us, but not essential. Given a list of points, I'd like to know what the max and min values for each dimension are, and what the range of each dimension is. I want to know "X ranges from 1 to 11, and Y ranges from 3 to 7". Knowing these figures helps us draw the graph on the canvas, and also helps when we initialize our random cluster centers (we'd like them to be within the range of the data points when we start them out). The getDataExtremes() method loops through all the points and each dimension in each point and finds the min and max values (note there's a hard-coded "1000" in there, which you should change if you're using large numbers). The getDataRanges() function is just a helper that takes that output and returns the range of each dimension (the maximum value minus the minimum value). We're just creating new points with random coordinates within the range and dimensions of our dataset. Once we have our randomly seeded centroids, we need to enter our k-means loop. As a reminder, the loop consists of first assigning all our data points to the centroid closest to it, then moving the centroids to the average position of all the data points assigned to it. We repeat that until the centroids stop moving. The above function is called by our "loop" function and calculates the Euclidean distance between each point and the cluster center. Note that the above algorithm loops through each point and then loops through each cluster centroid, making this an O(k*n) algorithm. It's not terrible, but it might be computationally intensive if you have a large number of data points or a large number of clusters or both. There are ways you can optimize this, which we'll perhaps discuss in a future article. For one, we can try to eliminate the expensive Math.sqrt() call; we could also try not to iterate through every point. Once we have our list of assignments -- in this case, just an associative array of point index => center index -- we can go ahead and update the positions of the means (the cluster centers). The moveMeans() starts by calling the makeAssignments() function. Once we have our assignments, we initialize two arrays: one called "sums" and the other called "counts". Since we're calculating the arithmetic mean (or average), we'll need to know the sum of points' dimensions as well as the number of points whose dimensions we're averaging. First we loop through our means and prepare our sums and counts arrays. Our sums array will actually be multidimensional, because we're storing each dimension's sum of each point of each mean in this structure -- so we have to zero-out the second-depth level of this 2 dimensional array. Then we loop through our assignments and increment the counts counter for each cluster center we have points assigned to, and additionally loop through the point's dimensions to fill in the sums array. At this point we have all the data we need to calculate the new positions of the cluster centers. The final loop loops through our results, calculates the mean position for each cluster center, and moves it. The final loop also checks to see if a cluster center had no points assigned to it. If it didn't have any points assigned to it, we give it a new random position. This is just us trying to kick that cluster center back into the solution. Finally, we wrap up this function by checking to see if any one of our cluster centers has moved -- and we return either true or false. setup() initializes everything we need, and then our run() function checks to see if the algorithm has stopped, and loops based on a timer so that we can watch the algorithm do its work in a reasonable timeframe. One major issue with the k-means algorithm isn't a fault of the algorithm's, but rather of the concept of the arithmetic mean, or average. The average is a pretty bad metric when you have outlying data. If you work at a company where 5 people make $50,000 a year but one person makes $1,000,000, the median salary is $50,000 (very representative of salary at that company), but the mean salary is $200,000 (not at all representative of salary at that company)! This happens with all sorts of data, and can and will happen in the k-means algorithm too. If you have a dataset prone to outliers, you'll find that k-means gets "stuck" on the outlier and ends up yielding poor results. In that case, switch to k-medians! The algorithm is nearly the same; instead of calculating the mean for your cluster centers, use the median instead. I believe -- but I'm not certain -- that calculating the median also has a performance advantage over the mean. As you can see from the example below, k-means works very well for our nice, neat data. Obviously it'll have more difficulty with messy data, like any other algorithm. If you run the example below a number of times (click the play button on the JSFiddle) you'll eventually see it fall into a local optimum. This should also demonstrate the usefulness of the "committee of machines" solving method: while a bad solution does pop up from time to time, it should be clear that a committee of machines will produce the correct solution reliably. Finally, if you like this series, please sign up for the mailing list below and tell your friends! I also appreciate discussion, so feel free to use the commenting tool below. And make sure to check out the other ML in JS articles! Survey: Would you buy an ML in JS e-book? 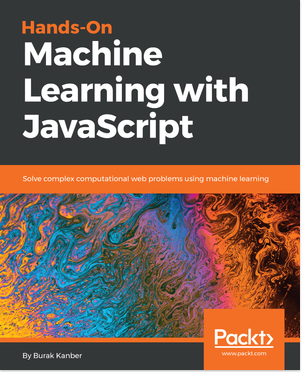 I would pay $10 for a DRM-free e-book with tons of ML lessons and JS examples.